Do you look in the mirror and feel that you have been putting on a lot of weight? Well consider this, a newborn baby elephant weighs more than 100 kgs at birth! An old saying in the Bible states ‘A fool is someone who looks in the mirror and later forgets how he looks like. Well, I guess it proves my point that elephants are quite intelligent as they can recognize themselves in a mirror. The brain of an elephant has more complex folds than all animals (except whales), which is actually reckoned to be a major factor in making elephants some of the most intelligent animals on Earth. They say a wise woman is the one who does her addition, subtraction, multiplication and division by using both her head and her heart. Well, in this case, all that elephant needs is a trunk! Yes, with the help of their trunk, elephants can sense the size, shape, and temperature of an object. With great power comes great responsibility, said a very wise man from Forest Hill, New York and nobody was more influenced by the saying than Spiderman and Elephants! Yes elephants, their precious trunk that helps them sense can grow to be about 2 metres long and it can weigh up to 140 kg. Now that’s a heavy responsibility to handle isn’t it? 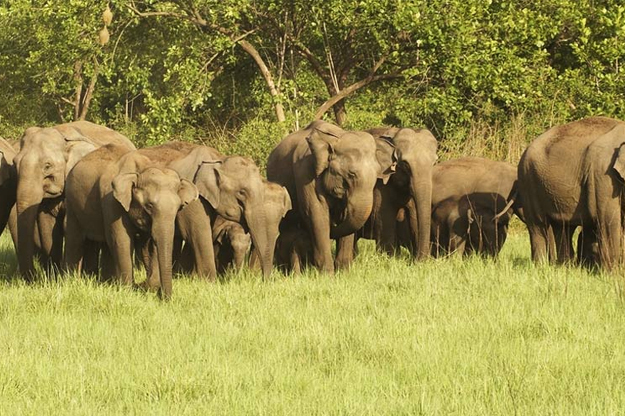 There is a human race that has invented cell phones, internet and satellites to communicate, then there is a race of elephants that communicate within their herds or between herds many from kilometers away by just stamping their feet and making infrasounds that are too low for human ears to perceive. The peace-loving and jovial elephants have no natural predators; however lions are sometimes believed to attack weaker elephants. The main threat that this large mammal face is from tiny human, who poach elephants for their tusks. According to a research in the year 2014, 100,000 elephants were poached in just 3 years worldwide. It is sad, rather shameful thing that humans are killing one of the finest animals of the planet for their self interests. These big, beautiful and innocent creatures have become endangered and what saddens even more is that despite their strong physique, this species is unable to save itself. Me and You, as a responsible travellers, can help save not only this beautiful animal but many other endangered species by simply saying no to goods made of their body parts. This small effort can bring big changes and help world to become a safer place for all living beings including elephants.